Fiat's special-edition Bravo | What Car? Fiat has announced a special-edition Bravo that's packed with high-tech equipment. 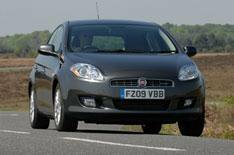 The Bravo MSN Special Series is the result of a collaboration between Fiat and Microsoft (MSN). It also uses the latest mobile phone technology from Sony Ericsson to give direct access to the MSN portal. Bluetooth connectivity with voice control comes as standard, which allows drivers to select a number by either calling it out, or saying the name of the person they want to phone. Incoming text messages can also be read out aloud. The car's high-tech entertainment pack includes a USB port and can support music files in MP3, MP4, WMA and WAV formats. There's also a satellite-navigation system with a 6.5-inch colour screen. At £13,255, the MSN Special Series costs the same as the 1.4 6v Active model it's based on. Other extra kit includes 17-inch alloy wheels, Tempesta Grey pearlescent paint and a leather-trimmed steering wheel. Fiat says that it will donate 20 to children's charity Barnados for each of the first 250 test drives taken in the Bravo MSN Special Series.